Over the past few months, the Arab Revolutions have cemented the belief that transitions to democracy are never a smooth affair. Libya is proving to be the most perilous of these adventures towards freedom. Libya is a country split in half, with opposition forces in charge of the country’s East while forces loyal to Gaddafi remain strong in Tripoli and Syrte in the West. What’s more, thousands have died since the start of the revolution whilst camps have been established to welcome migrants and foreign workers, many of them refugees fleeing to the Libyan-Tunisian border for shelter. The international community- whatever that means- seems to have come to a mild consensus that the keys to a resolution of the Libyan conflict lies in the establishment of a no-fly zone in order to prevent further bombarding by Gaddafi’s air force of innocent civilians. The idea obviously reignited the timeless debate over the legitimacy of a ‘humanitarian intervention’ and this no-fly zone was presented as a preferred option to all-out intervention. This solution, spearheaded by countries such as Britain and the United States, has thus far been supported by the Arab League which has called on the Security Council to act decisively to end the violence. As the battle for Libya raged on over the past few weeks, Muammar Gaddafi, true to himself, oscillated between brutal repression and televised comedy depending on where you stand. Fears abound in the region and beyond that Libya’s internal conflict for control over the country between rebels and loyalists will turn the country into a new Somalia. To jump to such an assumption is not as dramatic as some might think. 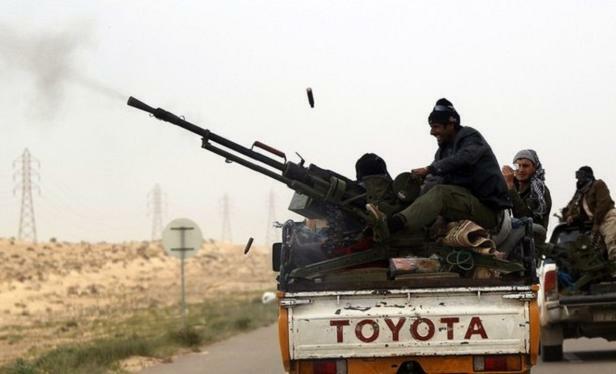 Libya’s complex tribal landscape and the arming of either side of the confrontation are sure to lend themselves to a scenario of prolonged civil war. Yesterday (15/03/2011) saw reports that the city of Ajdabiya had fell to Gaddafi forces in under an hour‘s time, highlighting the serious difficulties faced by the rebels in adequately holding positions in the face of an organised military arsenal (this morning Rebel statements are denying Ajdabiya’s fall). Despite having dissident officers at its head, the rebellion is now left to rely on untrained and poorly equipped voluntary recruits to carry out any defence of the cities it has captured. The fall of Ajdabiya is a strong signal of Gaddafi’s coming advance on the bigger city of Benghazi. Taking the city back will certainly not be a stroll in the park, with many predicting prolonged scenes of urban guerilla. Nonetheless, with more military options at his disposal, a stalemate of this sort can only be beneficial to Gaddafi. Ironically enough, those states that had happily accepted to sell Gaddafi arms in the first place, France in particular, now seem to have “rediscovered” their morality and become the most vociferous critics of his regime. With the international community tip-toeing towards what really should be a moral imperative of assistance to a just revolution, we are far from a swift resolution to this crisis. External intervention aside, I believe that a lot of what becomes of the Revolution in the coming days, will reside to a great extent, in the ability of either side to impose its own framing of victories and defeats to audiences at home and abroad. In neighbouring Algeria the chances of a Tunisia or Egypt-type revolution have been put to rest over the past weeks as a coalition of opposition parties and civil society groups repeatedly failed to mobilise significant numbers in their weekly marches. Whether this was the result of low adhesion or fear of the police arsenal mobilised remains a contentious public debate. Recent events have shown however that Algerian society is at a sort of boiling point. The country has witnessed countless strikes which continue to paralyse the vital education, transport and health sectors. 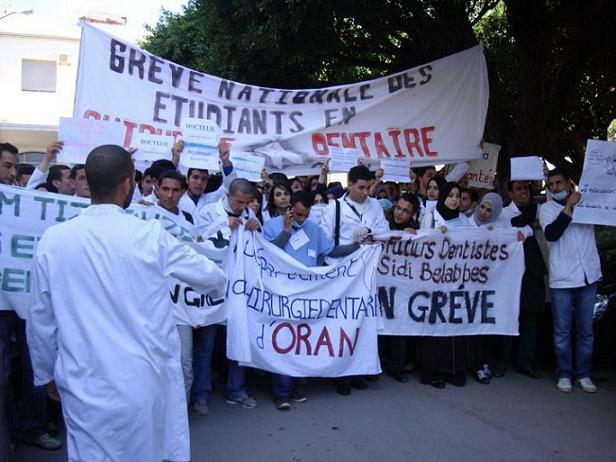 Students of Algeria’s more prestigious schools have been particularly present to demand reform to the entire education sector. The despair of many graduates in the country today lies in their inability to find adequate post-university employment. They have called on authorities to re-evaluate the entire sector and give greater meaning to their diplomas. What’s more, the recent disbanding of a close proximity paramilitary unit caused an important protest in the capital that police forces were unable to prevent. Though these protests have no precise political agenda, they are nonetheless symptomatic of a tense socio-economic climate. Voices have risen to call for a change they have nevertheless failed to articulate adequately. In this context, the Algerian press is ripe with rumours of an initiative by Algerian president Abdelaziz Bouteflika to radically revise the country’s constitution to move towards a form of regime reform. Though very little has filtered as to the goals or practical implications this change might carry, columnists seem to believe that the initiative would allow for a softer transition of power giving greater input to political parties in a new parliament as well as a renewed role for civil society actors. What the president and the establishment will certainly face in the coming months, should these rumours prove true, is the daunting necessity of revitalising an illegitimate domestic political class/system. Another pressing mission ahead is that of establishing a real dialogue with a nation’s drifting youth. A consensus seems to emerge that any foundation for dialogue should revolve around the primary belief and materialisation for the participation and respect of Algeria’s youth in all sectors of public life. In a nation where the vast majority of the population is considered ‘young’, it seems all too logical that any public debate around anything from economic strategies to media freedoms must go come from young people and be implemented by them. Should these rumour prove true then we might finally witness the meeting of important expectations and, with it, certainly the birth a new model for internal reform in the Arab world. Interesting indeed. But I have yet to understand why you say, “recent events have shown however that Algerian society is at a sort of boiling point”. I cannot think of a single week in the past three to four years without a demonstration, a strike or a riot somewhere in the country. I mean the Algerian society has always been at a boiling point. So what’s the difference today? Would it be the apparently “successful” (to be confirmed in the future) revolts/uprisings/revolutions in two Arab countries, and the few Algerian “opposition” members trying to surf the wave? I am of those who think the situation in Algeria is not improving, but I do not see anything different coming from the populations compared to the past years. If Bouteflika and the ruling system decide to make some changes, I believe it would be only to suit the “international community” (read the West) and save their reign for some more time. As to the youths, I still remember Zeroual’s speeches and how he addressed “chabiba” in most of them… So many betrayed promises. Now that libya is attaqued by the so called “”collation” ,my question is do we want democracy and freedom or new milatary basis and a new form of colonialism in our region? the arab league is as usual a useless institution that is never capable to take the right decision ,it was a case a few years ago for Irak and now for libya . we all agree that civilians need to be protected but are we protecting those in Benghazi and kelling those in Tripoli , are the westerns protecting civiliand or their intersts ( gaz and oil) ? what is amazing those days is to see the double standar applicable by those that pretend to be the defenders of human rights like France and UK.and the birth of a new international law based on force and militaery intervention when it suits the west. I believe that we are witnessing a new shaping in the map of the middle East and north africa in the name of democray.